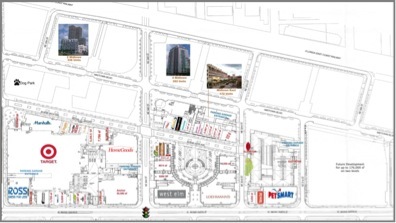 A 645,000 square foot mixed use project located in the downtown Miami market. The property was originally developed as a big box center that had challenges in lease up due to market timing, construction delays and a lack of flow from one block to the next. The project is centrally located with convenient access off of the I-95 with over 3,200 car parking. Developers Diversified engaged Sharon Dresser to lead the leasing efforts and to implement various events and functions to connect Midtown with the community at large adding to the branding of the center and giving it recognition within the trade area which went largely unknown. In 2009 during one of the toughest economic times, High Street Retail succeeded in taking the Shops at Midtown Miami from under 60% to over a 90% occupancy. This was achieved by adding a mix of national tenants such as Guess Factory Stores, Homegoods, Sports Authority; local brands like Lime Fresh Mexican Grill, Cherry Bomb Ladies Boutique; and franchise locations for Hurricane Grill & Wings and Yogurbella. Midtown was voted the #1 new restaurant neighborhood in 2010 and 3 of our new restaurants were voted best in their category.